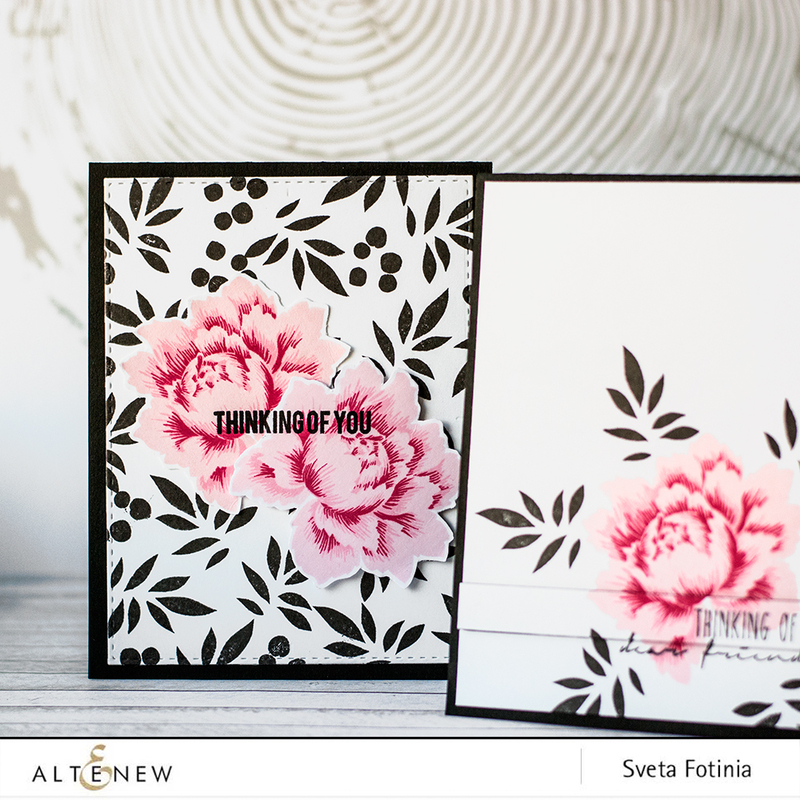 Sveta is here today and I want to share with you two monochromatic cards using incredible Peony Bouquet Stamp set! Most of all I like detailed lines in this stamp set, so I wanted to create something simple and eye catching. 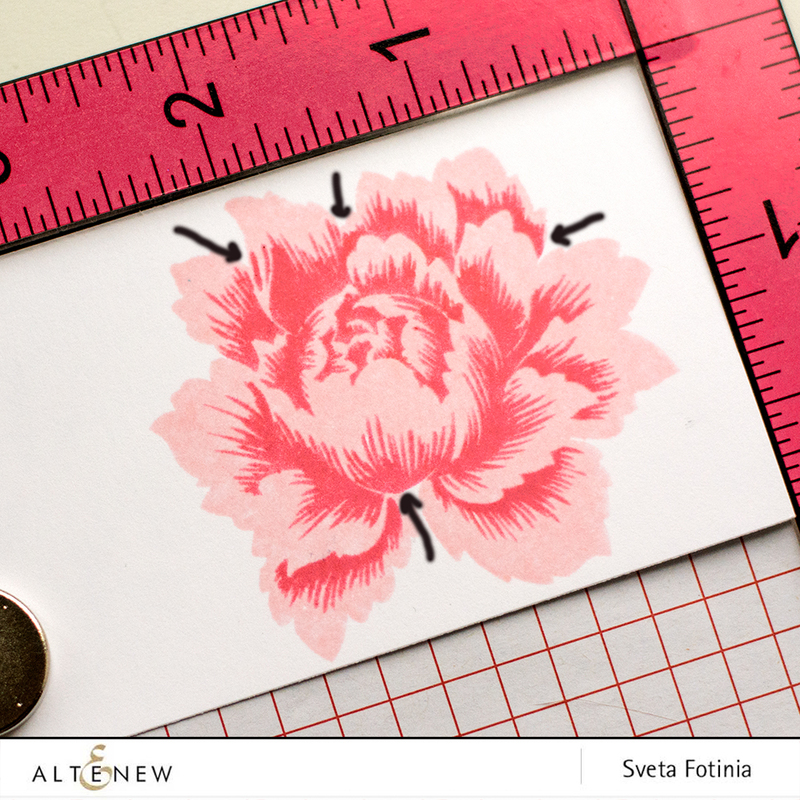 I added only one bold layer of peony’s leaves and used Jet Black Crisp Dye Ink to stamp it so the flower is still the main focal point on the card. 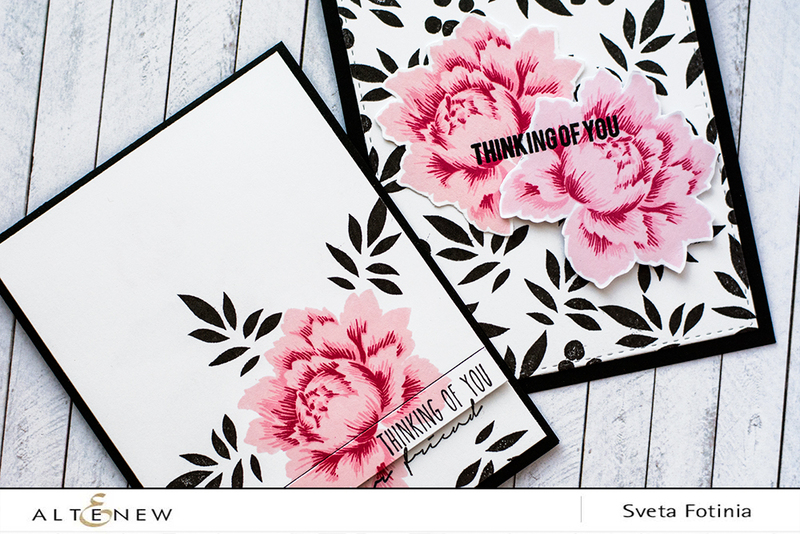 I went with Thinking of you stamp set for the sentiment and decided to pop-up a little stripe. I cut my card into three pieces using my paper trimmer and used a black foam adhesive to adhere a little piece with “thinking of you” words , and glue for other parts, adhering all of them on a black card base (Jet Black cardstock). This trick added missing interest for such a simple card. When I made first card I noticed that stamped black leaves look like die-cut when used with black card base. I loved this idea and decided to create a background with black leaves on it. In this card I also divided the sentiment with dimension: I stamped one sentiment along two flowers and adhered on of them using foam tape. Also I used Classic Crest Solar White Cardstock for my both cards. Hope my tips were useful and cards were inspiring! Beautiful! I love the first card with the cut sentiment. Perfectly lined up!! 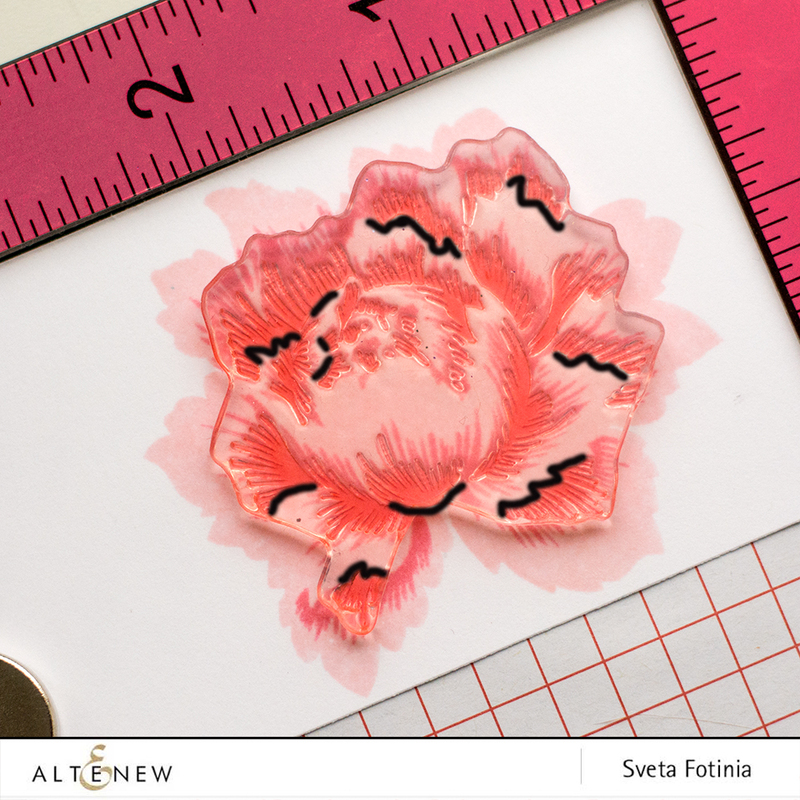 Great stamping tips..and gorgeous cards! 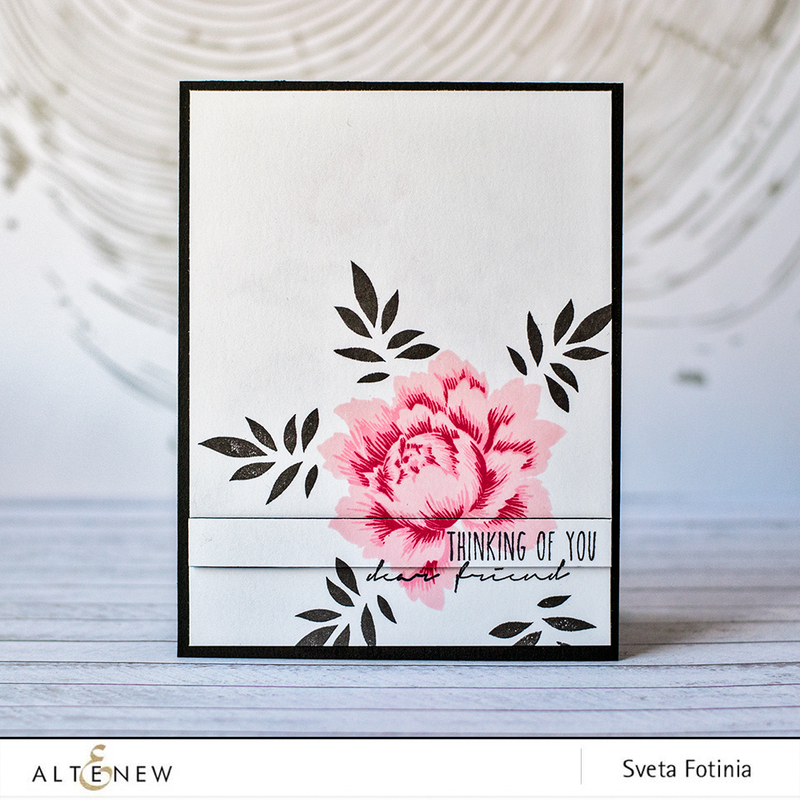 both of your cards are wonderful – love the color combo and designs! 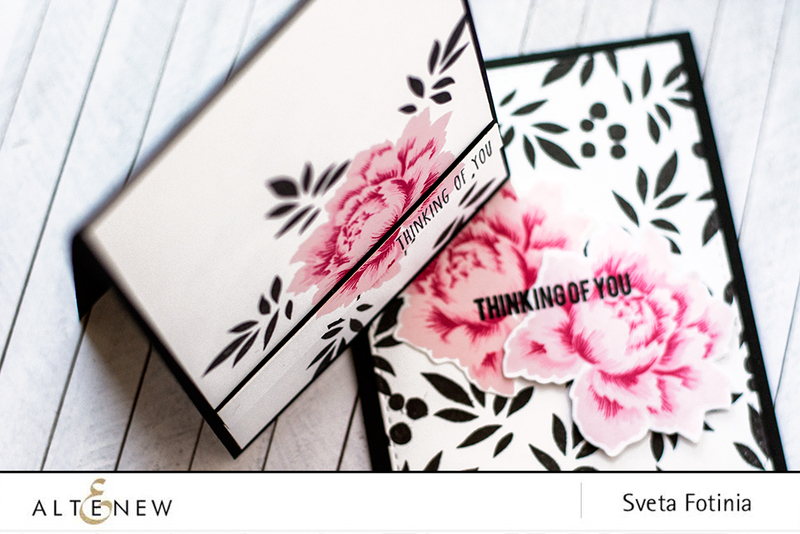 Thank you for the useful tips and the beautiful cards, Sveta! Love the idea of black leaves on black card base! So pretty. Thanks for the tips for layering. Sometimes I have difficulty with wiring stamps at first, too. Thanks for your instructions on this stamp set. It is my new all time favorite! Beautiful cards I will want to CASE! Thank you again. Perfection. Love the black leaves. They offset that gorgeous peony to a tee. Thank you for the layering points. I’ve been reluctant to try them because I have one layered stamp and find it very difficult. I’ll have to tr this stamp..I think it is gorgeous! Thank you also for the black background. I wouldn’t have considered it if I even thought of it. Thank you! These cards are simple but very elegant. I love the two tone look. The stamp and die set is amazing and I can’t wait to order these. Perfect1 thanks for the tips! I need these now. I think the leaves in black look like a cut out background as well. Great idea. The tips for lining up the multi step stamp images is SO useful. I always have to do it several times before I “get” the lining up. Beautiful card. Where do you get your inspiration? Just beautiful. The peony is my favorite flower. Finding this is perfect timing! Plan to use this stamp set for my Mother’s Day cards. Thanks so much for the tips! Thank you for your detailed instructions! I was really not able to line mine up until seeing your pictures! I love your beautiful card, too!!! Thank you for the tips about lining up the layers. I think I’ll mark my stamps so it’ll be easier for me to do the same. And I just love your cards. The black leaves are a great background for the beautiful flowers! and they do look like they’ve been cut out….clever! 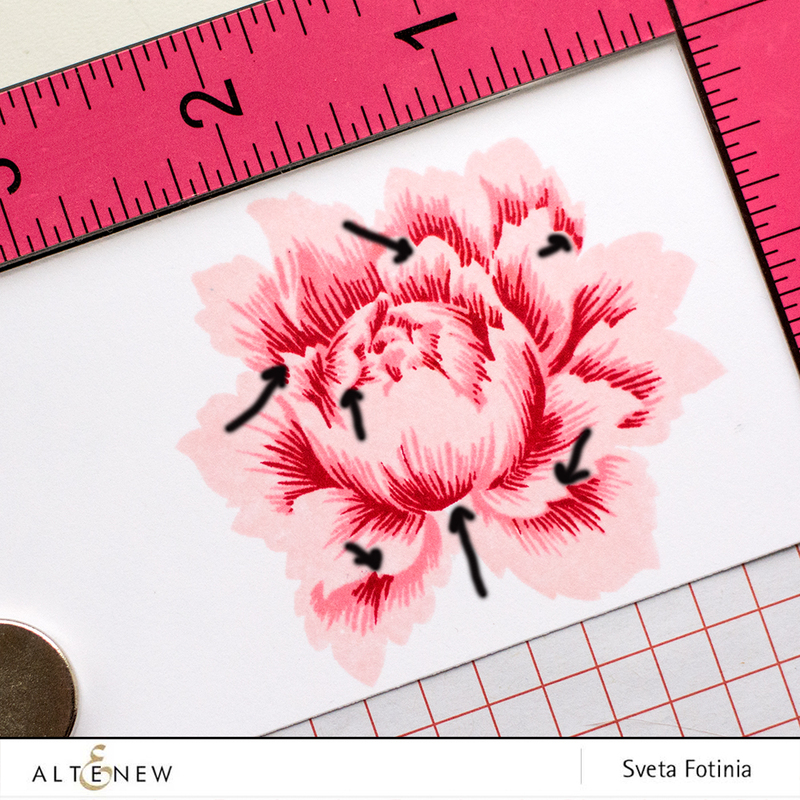 Thank you for sharing your beautiful cards and your tips for lining up the layers.